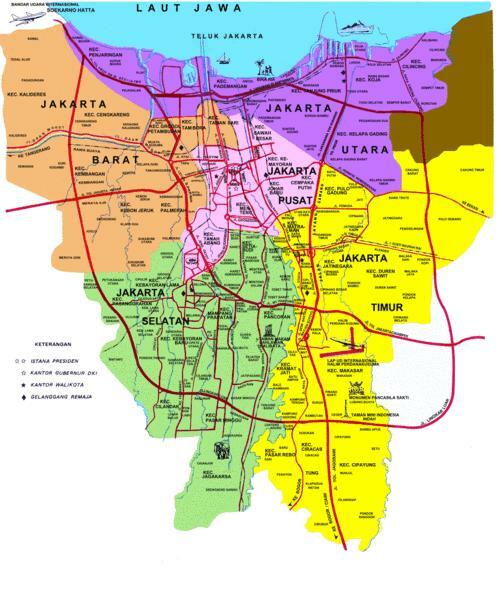 Jayakarta name was changed to Batavia. Batavia is the natural state of swampy country like the Netherlands, their homeland. They also build canals to protect Batavia from the threat of flooding. City government activities are centered around the field, located about 500 meters from the airport. They built elegant town hall, which is the position of the center of the city government of Batavia. Gradually the city developed to the south of Batavia. The rapid growth resulted in a state lilngkungan easily damaged, so the Dutch authorities forced the government to move the center of the higher lying areas. This area called Weltevreden. The spirit of nationalism in Indonesia decides to by students in Batavia at the beginning of the 20th century. Fatahillah, the Founder of White RoseJakarta History Museum (MSJ), better known as Fatahillah Museum, because it lies within the region and at the same Fatahillah Demak commemorate the soldiers who won the Palm Sunda and rename the White Rose city.At first, the city is named Sunda Kalapa. Based on the inscription written Kebon Coffee, name Sunda Kalapa expected to appear in the tenth century. Residential area is rapidly developing into the port which is then visited by many foreign ships.In 1522 the Portuguese governor Alfonso d 'Albuquerque sent messengers to meet the king Pakuan Pajajaran to make lasting friendships.King Pakuan Pajajaran take steps cooperation offered to obtain assistance from the Portuguese in order to face the threat of the Sultanate of Demak, who was already destroyed several Hindu kingdom. In return, the Portuguese got a commodity pepper. But apparently, the Portuguese did not keep their promises.In 1526, the Port of Sunda Kalapa attacked by troops under the command of Fatahillah Demak, a commander allied with the Demak Cirebon. Fatahillah conquered Sunda Kalapa on June 22, 1527. Fatahillah Sunda Kalapa then changed his name to Jayakarta, meaning "complete victory". Until now June 22 is celebrated as the birthday of the city. Being from the White Rose of BataviaPieterzoon January 1619, Coen, a Dutchman, had occupied the White Rose, and changed his name to Batavia. Batavia comes from the name of the tribe who inhabited the city Batavia, but there is also a version that says that Batavia coming from a region in the Netherlands.January Pieterzoon Coen ambition is to make Batavia as a trading center in Asia Pacific. He applied the same system of government in his native country in the city of Batavia is.As a second person who controls the activities of the VOC in Asia, Jan Coen Pieterzoon determined to uphold the supremacy of the whole city. He wants to make Batavia as a meeting place for the Dutch ships, the main port for the storage of goods, and the center of the VOC in the East Indies.All orders and policies for the entire region of the VOC in Asia created and established in Batavia and all the important institutions of the VOC in Asia such as Governing Council of Asia, the high court, keeping the head office and warehouses located in Batavia. History House Museum of History of JakartaIn 1620, Jan Coen founded Pieterzoon Stadhuis (town hall). 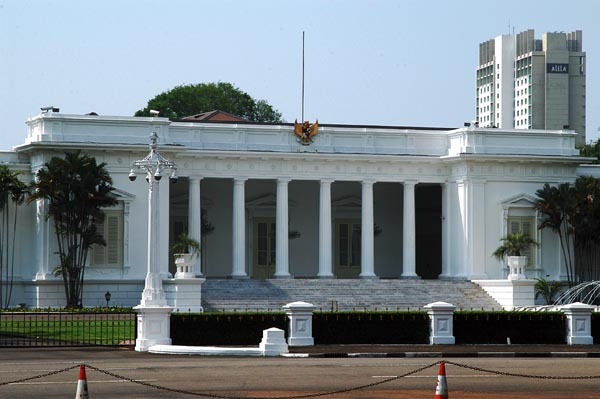 This town hall is now known as the Jakarta History Museum. 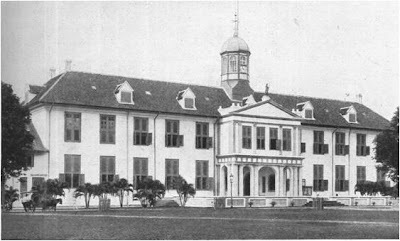 Less than 6 years, the building was attacked by the forces of Sultan Agung of Mataram Kingdom. As a result the building was badly damaged.New in Mataram in 1627 after troops repelled back by the Dutch, the Dutch re-established the building and survived until the year 1705.Due VOC think this is too simple to buildings as grand and rich as the city of Batavia, it was decided to rebuild this city hall. Laying the first stone by Wilhelmina Petronella Van Hoorn, who was the governor's daughter Joan van Hoorn. In 1710, this building was completed and inaugurated by the Governor General Abraham van Riebeeck.Stadhuis used as a place to take care purposes such as marriages registered citizens, convene, as a shelter orphaned children, as a prison, and as a place of punishment Implementation, both whipping and capital punishment.Architecture BuildingThese buildings have two floors, which in the beginning, the first floor serves as the administrative activities, and the second floor serves as a court.On the second floor of the building, there is a glass painting depicting the story of King Solomon's wisdom when faced with two mothers who fight over a baby.Stadhuis buildings in Jakarta has a resemblance to Paleis op de Dam (Dam's palace) who stood Amsterdam, The Netherlands. Paleis op de Dam buildings designed by Jacob van Campen as the Amsterdam city hall, in addition, another town in the Netherlands who also has a similar town hall town hall that stood in Batavia in his time was Maastricth town hall.Chinese community in BataviaAround the year 1600-1700's, Chinese people have a lot of the newcomers settled in Batavia. Their relationship with the locals said to be quite good. Most of them do the trade. Their average success in the business world. Once the rapid arrivals of the Bamboo Curtain country, the Netherlands require implementing legislation in which the Chinese have to report to the Netherlands if they wanted to live in Batavia.Increasingly, regulation is increasingly urgent Chinese citizens. To a peak, in 1740, Chinese citizens in revolt in the Netherlands. Unfortunately, they have surrendered on the Netherlands.In 1740 is one of the dark history of Chinese people in Jakarta. In that year occurred the massacre of Chinese citizens by the Dutch. One of the places of execution of the Chinese people are on the front page Stadhuis. From Stadhuis The Jakarta History MuseumJakarta History Museum was inaugurated by Governor of Jakarta, Mr Ali Sadikin on March 30, 1974. Batavia Foundation who first proposed the plan to establish a museum on the history of Batavia.Batavia Foundation or Bataviaasche Genootschap a foundation for the arts and sciences and one of the intellectual organization of the oldest in Asia. Founded 22 April 1778 by Cornelis Jacobus Mattheus Radermacher. One member of the famous Genootschap Bataviaasche is Raden Saleh.At first, the Jakarta History Museum occupies the building has not been ex-Stadhuis these, but occupy the building now used as the Museum Wayang.Puppet Museum building itself was originally a Dutch church, but the building that stands now is not the original building, because the original building was destroyed by an earthquake.Hermes, The GuardianIn the backyard of the museum is a statue of Hermes, who according to Greek mythology is the statue of luck and patron of merchants. Initially the statue was not here, but on the bridge Harmony. Hermes statue came from a family of Ernst Stolz as a sign of gratitude to the government of Batavia for the opportunity to trade gained in the Netherlands Indies.Statue of Hermes who was on the bridge Harmony (smaller size) are currently only a replica only.Punishment in the Colonial PeriodIn the backyard Stadhuis, when we descended the stairs, we can still see the old buildings that are intended as a dungeon. People who've felt the cold and darkness of the dungeon in Stadhuis Diponegoro Batavia, among others, Untung Surapati, and a large number of Chinese residents who were captured during the rebellion in 1740.The number of prisoners incarcerated Stadhuis often exceeds the capacity of prison space is always so crowded. This dungeon is finally closed in 1846.These cells are only receiving light prison outside of bars on the front which also serves as a vent. The prisoners are serving sentences with a heavy iron chain tied his legs so he could not escape.Stadhuis prison complex is divided in two, the west wing for the civilians, while the east wing for military prisoners.There are different types of penalties imposed by the VOC, namuan punishment distinguished between Europeans and non-European.They are accused of a crime will be arrested and put in jail pending a court decision. The judge can sentence a very light as only obliged to pay the fine, but can also be very heavy, ie the death penalty.Punishment is usually applied to the army was humiliated by the defendant to enter into an iron cage and then paraded in front of city hall.There is also a punishment known as the wooden horse punishment (het Houten paard). Het Houten paard a torture device that is placed under the tamarind trees in a military prison. The shape sepertu piggyback with the back filled with sharp iron. The condemned are often ordered to ride "horse" is up for days and their legs are also hung with stone ballast. The general public is allowed to watch when the punishment takes place.In addition, there are penalties swing, where employees of the Company who are guilty be punished by the feet and hands were tied and then pulled up, then allowed to fall to hang.The robust, Fertility SymbolStill on the back page of this museum, there is a cannon whose name the robust cannon. 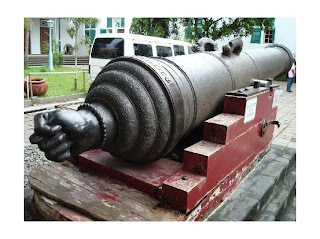 This cannon was made in Macao, brought to Malacca by the Portuguese fleet was still in control of Malacca. Dutch fleet in 1641 brought this cannon to Batavia. In almond cannon have the words "Ex IPSA Renata me sum" which means 'from myself, I was born'. It was said that this gun is a symbol of fertility, perhaps because of writing and form a fist with the thumb tucked between the index finger and middle finger are on the gun body weight.Legend cannon stored in them is the story of robust Si King Pajajaran who has a beautiful daughter who contracted a strange disease. From the crotch out of a magic beam that every prince who comes to mempersuntingnya the attack. The King then make a contest to find someone who could cure the princess. Almost all the healers and the smart people in the region Pajajaran these contests, but none who managed to cure the princess. Until one day, came the messenger of the Company who offer themselves. The king agreed with a condition, that the Company should submit three cannon. Terms tersebt approved, and a third cannon was given to the King. Cannon was named Ki Amuk, Nyai Setomi, and Si robust.While the version of written history, the cannon was made in a factory weapons St. Jago de Barra in Macao, China, by a Portuguese. This cannon was placed in the Castle of Batavia to maintain the harbor and city.